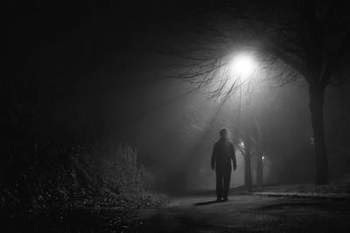 Every morning, I walk out into my cold, dark neighborhood at 5:30 AM. I think I have found the perfect way to start my day; the perfect step -- both literally and figuratively -- into the world for someone who is an introvert but whose career relies on being around large numbers of people. I walk head-down, hood-up, hands jammed into the pockets of my heavy coat. My thoughts unwind gently, the way accordion-crunched drinking straw wrappers uncurl after a drop of water: slowly and meanderingly. I see bedroom lights wink on in the periphery, here and there. The only other signs of life within houses is the occasional blue glow of televisions and that glow makes me glad my senses haven't yet been assaulted by the electronic storm that the day will become once I step into the doors of my school. Sometimes, I'll pass another walker and he will either cross to avoid me (which I respect and understand) or we will grunt a careful "good morning" low enough to avoid sending ripples into the silence we are both enjoying. But most days, I am alone. Gloriously alone. It's the difference between being hit with a bucket of cold water and taking a good breath before the plunge. It's a stretch before the game. But today, the silence was destroyed. As I was taking the turn for home, a porch light blared on and drew my eye. A boy, no older than seven, opened the door stepped out and yelled the first words I was to hear for the day, back into his house: "I hate you. You...idiot!" He slammed the door shut and, holding no school bag and wearing no jacket, despite the 29-degree morning, climbed into his parents' idling minivan and pulled the door shut so hard I thought the glass would shatter. For the rest of the way home, the silence seemed louder. I feel bad that your morning peace was broken. Truly. I know how awful that is. But here, I feel worse for that boy. Having to get into a car at 5:30 or 6 on a Winter morning. Obviously way before school starts. For what? So his parents can both work FT jobs? Was he being shuffled off to a "before school care" program? Rather than staying snug in bed for another, much-needed, hour of sleep? I know it's not Hard Times or anything. But I'd be crabby too.